This banana oatmeal muffin recipe is the most delicious banana nut muffin recipe I have ever tasted. Your whole family will love these healthy banana muffins. They are incredibly quick and easy to make (so there’s barely any dirty dishes to clean) and only bake for 20 minutes to a beautiful golden brown. When you subscribe to Simply Healthy - our healthy eating tips and recipes guide - you'll receive a free printable muffin recipe book. I’ve been trying to reduce the amount of wheat and dairy in my diet and really wanted to create a delicious muffin recipe using less wheat and more oatmeal, which we know, is really good for you. I had some over-ripe bananas that were begging to be made into healthy banana muffins so I wasted no time getting started. I had rolled oats in my cupboard (I eat oats every morning for breakfast, so I always have them in abundance) and processed them to form crumbs – some were very fine and some were more chunky. I have made this recipe using whole rolled oats before and it came out just as good, so if you don't have time to the oats finer, then just throw them in whole - no problem. I wanted oats to make up the bulk of the dry ingredients and used whole wheat flour with the oats, but you can reduce the ratio if you prefer to use even less wheat (see cooks notes). I was so absolutely thrilled when I saw what they looked like coming out of the oven and over the moon when I tasted one – so light and moist. They are in my opinion, the absolute best, most delicious muffins I have ever tasted and what is so great is that they are not fatty, not saturated with sugar (you can even reduce the sugar to 1/2 cup and they’ll still be sweet enough), are high in dietary fiber from the banana, nuts and whole grains. They contain no processed white flour. The bananas are packed with vitamins and minerals and are especially high in potassium. Walnuts are a brilliant source of omega 3 fatty acids and Vitamin B6 and olive oil is high in monounsaturated fat which is great for heart health. 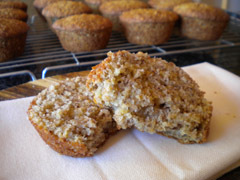 My children absolutely love these incredibly easy banana muffins – they make a wonderful nutritious snack, are great for lunch boxes, tea or anytime treat. 1. Combine all the dry ingredients together (no need to sift), then add the eggs, mashed banana, oil and nuts. 2. Mix together till just combined – do not over stir. 3. Spoon the mixture into a greased 12-cup muffin tray. 4. Bake at 180ºC (350ºF) for 20 minutes or until golden brown and cooked. If you would like to use even less oats, you can use 1/2c whole wheat flour, 1c rolled oats or oatmeal and 1/4c oat bran. I left the oats whole and the muffins were equally delicious. 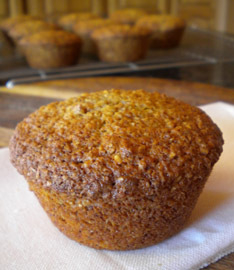 For a wheat-free muffin, leave out the whole wheat flour and process 1 1/4c oats to form fine crumbs, then add 1/2c oat bran...then continue to follow the banana oatmeal muffin recipe as usual. Sign up for our healthy eating and recipe guide and receive our free printable healthy muffin recipe book. Our gift to you to help make healthy eating an easy part of your life!